You have worked very hard as the primary caregiver for your parent or spouse. But now, after moving them to an Aegis Living community, you can hand over the tasks of cooking, cleaning, laundry, grocery shopping, and more to us. Our care staff will tend to your parent’s needs with compassion and dignity. Relieved of the stress of caregiving, you will be more relaxed to enjoy the company of your parent and spending time together as a family. 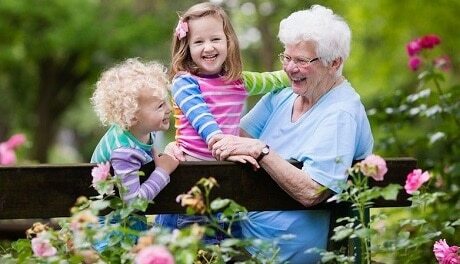 Visitors are always welcome in our assisted living communities—especially the energy that children or pets can bring. With a little preparation and a few creative ideas, there are plenty of ways to share quality time together in an assisted living community. Take advantage of the events and activities that the community plans. Our Aegis Living communities welcome guests during mealtimes. We suggest you contact your community ahead of your visit to reserve a spot for lunch or afternoon tea. Consider dining al fresco when the sun is shining or bring your son or daughter to share an after-school snack or smoothie with their grandparent. Dining with your parent is also a good time for your children to practice their best table manners and dining etiquette. Our Life Enrichment Directors are experts at planning daily activities and special events for our residents throughout the year. Many craft projects, cooking classes, exercise programs, games, or local day trips have multi-generational appeal. We suggest that you contact your community Life Enrichment Director to propose an event or activity appropriate for you and your child to participate with your parent. Your parent will love sharing time as a family, and our other residents will enjoy the enthusiasm and energy of your children. When the weather cooperates, go outside! Enjoy benches on the grounds of our communities, bring the dog to walk around the block together, or take your loved one to a nearby park. If you are visiting with your children, bring a game of croquet, a bottle of bubbles, or a ball to toss to keep them entertained. If you are heading outside to enjoy the day, remember to bring sunscreen, a hat, and sunglasses. Just like you once did in grade school, bring a special object to the community to share. Share a short story about why the object is important or unique. Storytelling is an excellent way to share memories and to communicate. If you have a young child or grandchild, have them bring a favorite stuffed animal with them to introduce to the staff and other residents they meet. With minimal mess, coloring is the perfect project for children and adults alike. Whether you are just learning to hold a crayon or have years of colorful experience, a pile of crayons, pens, and colored pencils can make for a beautiful afternoon of art. Adult coloring books are now trendy and offer a range of creative options, or a simple stack of white paper allows the imagination to run wild. Enjoy time creating your masterpieces together. There is no age limit to laughter, and a great way to start the fun and giggles is by playing a game together. For smaller children, we suggest old favorites like Go Fish or Memory. Teens may benefit from learning more challenging games like chess, cribbage, or bridge from a grandparent. Consider purchasing a unique game that stays in your parent’s apartment that is only played during your visits. This exclusive game will give something for your child and parent to look forward to playing together. Like the special game, find a popular book that is kept in their assisted living apartment. Share a chapter together from this book each time you visit their home. Books are a wonderful way to transcend the gap between generations. Many seniors will enjoy hearing classic stories again such as Charlie and the Chocolate Factory or The Chronicles of Narnia. Classic books that they may have once read to you as a child are wonderful memories after all these years. If your parent has dementia, many of these same ideas will apply to a visit with them. Find a comfortable spot without distraction, determine the best time of the day for your visit, and adjust your expectations appropriately if they are tired or having a bad day. Being flexible and finding meaningful ways to connect through music, old photographs, comfort foods, or just holding their hand will enrich your visit. You may have seen the life skill stations in our Aegis Living memory care communities. We suggest interacting with these on your next visit. These are small vignettes that represent a space in time for your parent to revisit. They can watch episodes from The Joy of Cookingin our Julia Child’s kitchenette, polish the bumper of a vintage car, or visit a virtual lake cottage similar to your family vacations. These life stations are meant to ignite fond memories such as raising children or having a sense of purpose like waiting at the bus stop to head off to work. Use the props within our life skill stations to unlock memories or share stories together. Visiting your loved one in an assisted living community is not only good to share quality time with them, but an opportunity to meet the care staff, their new friends and neighbors, and other families. There is no prescribed duration of time for a visit. Keep in mind, their energy level and how you are feeling during the visit. Your loved one will welcome the visit from a familiar face, and you can be reassured they are good hands.